Hyperlinks are the glue that holds the Web together. Without links, the Web would be a very different place, that’s if it would exist at all. Using a simple HTML element — the <a> element –you can create a bond with any other web page on the Internet. Hyperlinks are magical. Hyperlinks are fundamental to the Web. They are always just there. Maybe that’s why many site owners and web designers don’t pay them the attention they deserve. The design of the HTML <a> element is crucial in the user’s reading experience; we should take enough time to design them well. I’m about to share with you some hyperlink design tips that will lead to a better user experience, enhanced web accessibility, and maybe even bring improvements to your search engine rankings. As web designers, we like to innovate and experiment with different navigation techniques, but sticking with certain design conventions is important. One of the things that need to remain conventional is our hyperlinks. 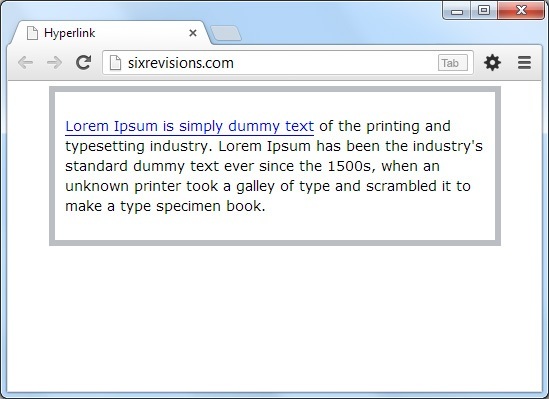 According to a study in link readability, the regular Web user sees blue-and-underlined text as links. Blue and underlined is a good standard to stick to, for no other reason than it’s what we Internet users have been acclimatized ourselves to. Below you will see 3 different hyperlink designs. They are from top newspaper websites. On the surface, these are all good hyperlink designs. They are some shade of blue. They stand out amongst the surrounding body of text. But why is The New York Times hyperlink design better than the other two examples? 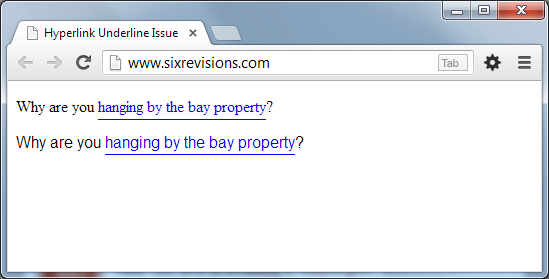 Let me show you an easy method of testing if your hyperlinks clearly stand out from its surroundings. Let’s look back to our earlier examples, but this time we are going to view them when they are blurred and in black and white. BBC uses a bold font weight to create emphasis on their hyperlinks, which is marginally better than The Guardian’s hyperlink design because it at least stands out a bit more. With The NY Times, it’s still possible to work out where the link is. Now here’s where it gets tricky. Here is where hyperlink design gets a bit unsimple. Here is where our convention of underlining links fail. 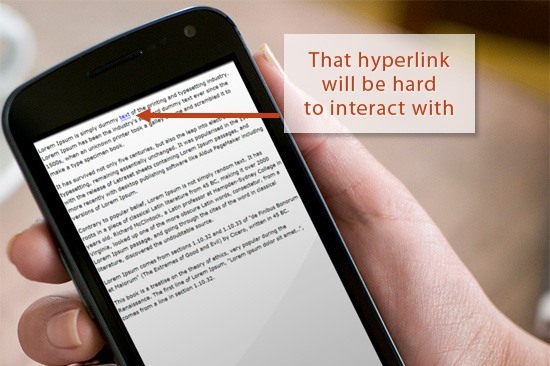 There is a study that shows that readability decreases when we underline the text in our hyperlinks. Essentially, the researchers are saying that our current conventions for hyperlinks — underlined text — should be changed systemically. The reason why underlined hyperlinks reduces legibility is that certain characters that go below the base line — characters with descenders extending below the underline such as p,g, j, and q — are getting affected by the text-decoration: underline CSS property value. What’s the Solution to This Readability Issue? We can fix this readability issue ourselves. 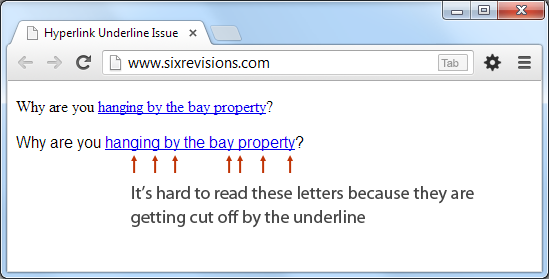 We don’t have to wait for a change in the way web browsers render underlined text by default. How? We can use the CSS border-bottom property instead of the CSS text-decoration property to underline our hyperlink elements. 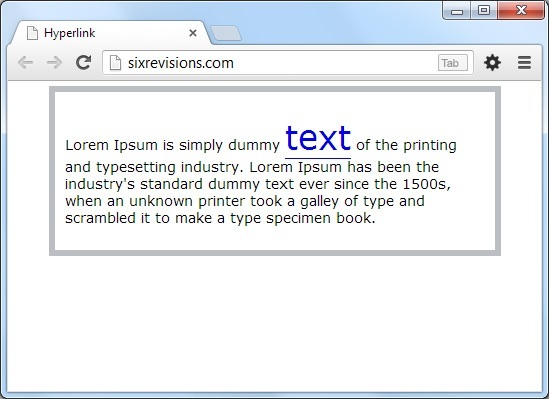 Using the border-bottom property can place the underline a few pixels below the affected characters, making the hyperlink easier to read. Even more powerful than just fixing a readability issue, we can also control the underline’s style independently from the hyperlink text color, thereby decoupling these two components of a hyperlink. For example, we can reduce the hyperlink underline’s distinctiveness to make the text more legible, or we can make it more distinctive to make the entire hyperlink design really stand out. This next concept I’m going to discuss goes a bit into content strategy territory (which is a big part of web design process). Some of you might dislike this suggestion because it deals with the content creation process, and some of you might not have control over that part of the web development process. The basis for this next tip I’m going to share is Fitts’s Law. The concept of Fitts’s Law is simple. The law states that the larger something is, the easier it is to see and interact with. That makes sense, especially in the context of touchscreen devices where the size of your elements matter, where the input device (our fingers) is less precise than a mouse pointer. Using a finger to click on a hyperlink can be a pain; often times you will have to zoom in for small links, adding an additional barrier towards users getting the action they desire (which is to interact with the hyperlink). But there is only so much we can do with the style of our links. We can bold them, underline them, change their color. How about making them bigger by changing their font size? If we change the <a> element’s font-size property, it affects the reading flow, and can affect the consistency of our line-heights. So we can’t expand them vertically. We will need to expand them horizontally. Having longer anchor text is a user-friendly SEO tactic. That is, hyperlinks with longer link titles is better for users according to Fitts’s Law, but it also has the nice side benefit of being better for search engine rankings. Anchor text should be descriptive and should tell the user and search engines what the page you are linking to is about, according to Google’s Search Engine Starter Guide. Say you were writing about walls. Not only is the second version better for our user, but it is additionally better for search engines too because there is more context than the anchor text that just says “here”. According to a study by Google blue links got more clicks than greenish-blue links. The study I referenced earlier about underlined text readability likewise affirms that Web users immediately recognize links when they are blue and underlined. However, in my opinion, not all hyperlinks absolutely need to be blue. The important thing about hyperlink design is that your links are obviously links. If you can achieve that with a different color other than the conventional blue color, go for it. Microsoft Development Network (MSDN) supports this concept. The fundamental guideline about designing hyperlinks “is users must be able to recognize links by visual inspection alone—they shouldn’t have to hover over an object or click it to determine if it is a link,” according to their link design pattern guideline. They didn’t say anything about links needing to be blue. There are some cases where blue-colored links aren’t the best option. For example, if the background color makes it hard to read blue links, then usability and readability triumphs over the standard blue link convention. Always do what is best for the user, even if that means breaking conventions. 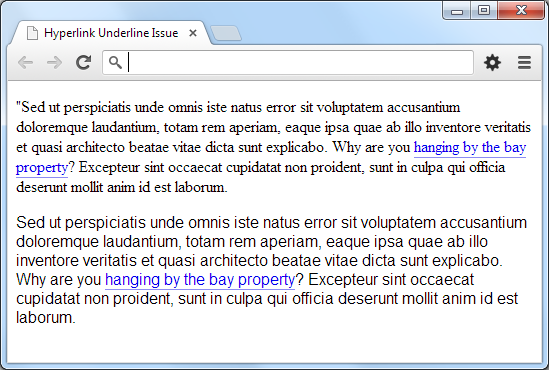 Designing hyperlinks should be well-thought-out. Blurring and removing color from the design is a quick way of demonstrating how well your links stand out. Underlined text is a strong and familiar convention. The problem with underlining text, though, is that readability decreases. 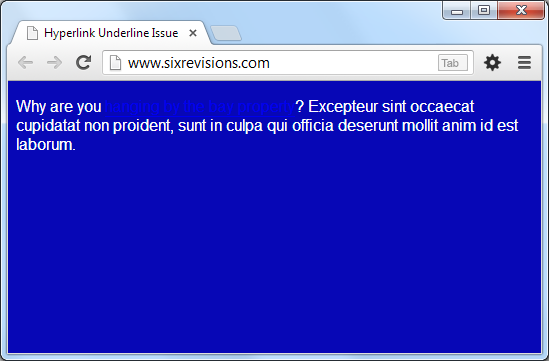 The solution is to use CSS to remedy the issue. Using longer descriptive anchor text can improve usability (Fitts’s Law), with the added benefit of being better for search engines. The one thing that is important in the design of hyperlinks is this: hyperlinks should obviously look like hyperlinks.